Shangri-La's Boracay Resort & Spa is a luxury resort located on a lush hillside facing the sea at the Northwestern side of Boracay Island, Philippines. It features two exclusive white sand beaches, the smaller Banyugan Beach and the longer Punta Bunga Beach. 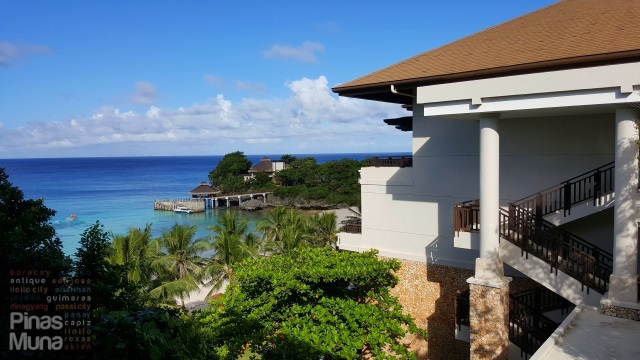 Shangri-La's Boracay Resort & Spa is comprised of 219 elegant and spacious guestrooms and villas which combine contemporary and Filipino designs. The resort is secluded by a 12 hectare verdant forest which creates a sense of earthly paradise isolated from the outside world. 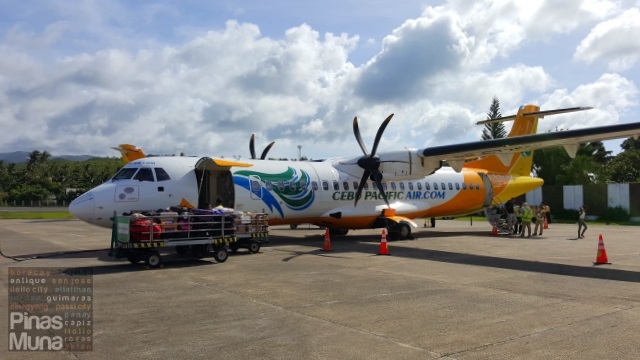 From Manila, guests can take a one-hour flight to Caticlan Airport. 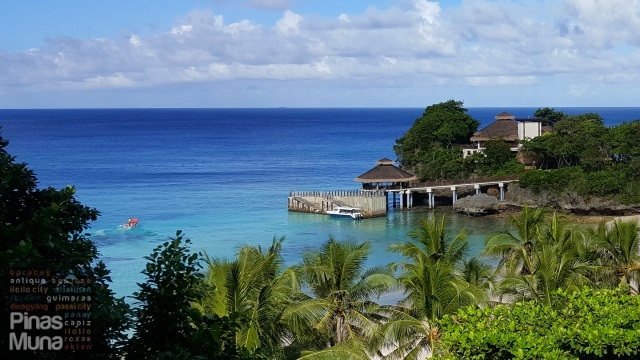 The luxurious Shangri-La Boracay experience begins as soon as you step out of the airport where you will be welcomed by resort's airport representatives who will assist you with your luggage to the resort's private shuttle. From the airport, you will be transported to the resort's exclusive jetty port and lounge in Caticlan. No need to line up to pay for terminal fee and environment fee because these, including round-trip land and sea transfers, are already included in the room rate. At the lounge, guests can relax over refreshing beverages while waiting to be transported to the resort. Your bags and luggage will be handled by the staff so you can have a stress-free vacation. From Caticlan, the resort's private speedboat will take the guests directly to Shangri-La's boat jetty. The 15-minute speedboat ride is an experience in itself as it cruises in front of Boracay's White Beach. Welcome to your private paradise where a powdery white sand beach lies between the clear blue waters of the sea and the lush green hills of the resort. Shangri-La's boat jetty is situated at the resort's Punta Bunga Beach lined with towering coconut trees. 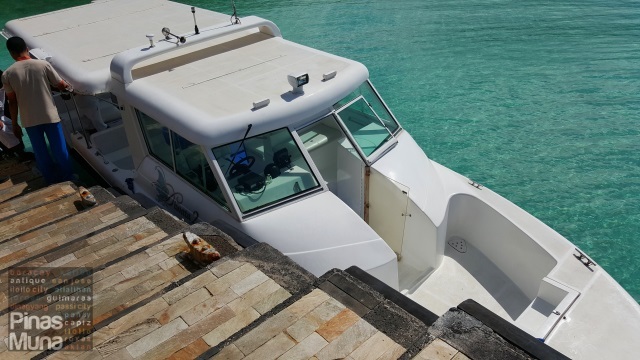 The resort's staff will assist you as you disembark the speedboat. Again, don't worry about your luggage, the staff will take care of them. 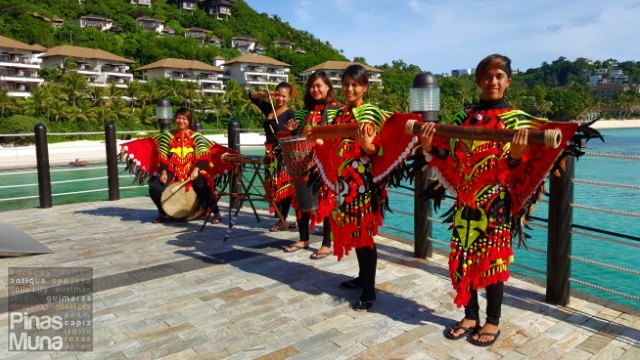 As you step into the sea pavilion, you will be welcomed by the energetic beat of drums played by local kids dressed in colorful and festive Ati-Atihan costumes. At the pavilion you will be assisted by a guest services representative. 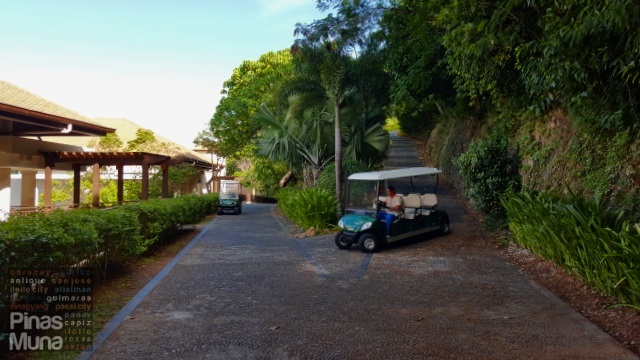 There is a golf buggy waiting to transport you to the resort's lobby. The lobby is located at the resort's main building. A walkway connects the driveway to the reception area. On both sides of the walkway are ponds lined with fountains with steady flow of water, the sound of which was very relaxing to the senses. The lobby has high ceilings which makes the area feel very welcoming, spacious and airy. At the reception area, we noticed that all of the staff were very gracious and hospitable. Welcoming us at the front office was Yoomi, the resort's Korean guest services representative. She led us to the Lobby Lounge where we comfortably sat and enjoyed sipping the refreshing welcome drinks while Yoomi processed our check-in. Check-in was quick and stress-free. After making an incidental deposit of P5,000 per night, a receipt was issued to us together with the electronic keycards to our room. A golf buggy was waiting for us at the drive way. Yoomi joined us so she can show us our room. 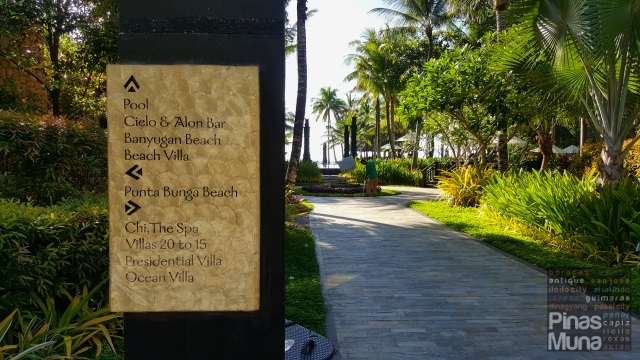 While the buggy was driving through the property, Yoomi gave us some pointers about our stay, including tips on how we can better enjoy our stay at Shangri-La Boracay. A very handy resort guide was also handed to us by Yoomi. It contained a map of the resort and a list of activities which guests can enjoy at the resort. 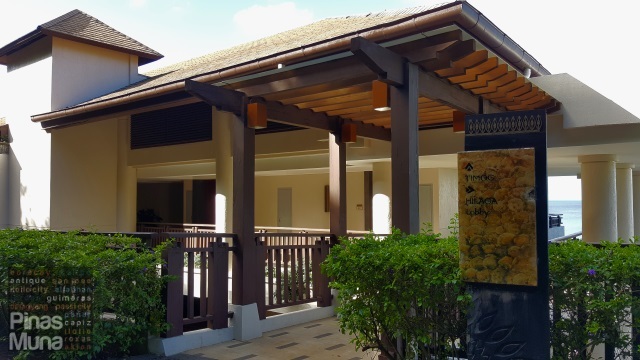 We are really impressed by how well maintained the resort is. It's clean everywhere you look, and the gardens are well manicured. The buildings are in excellent condition and looks newly painted. 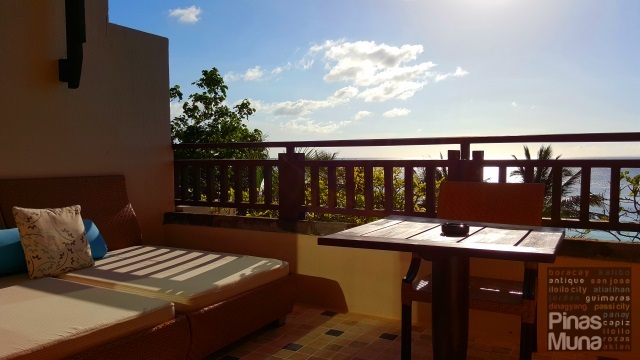 We were billeted in a Premier Seaview Room situated at the Timog building cluster which is facing Punta Bunga Beach with a panoramic view of the sea. The room was already pre-cooled when we entered. Our bags and luggage were already placed on the rack. 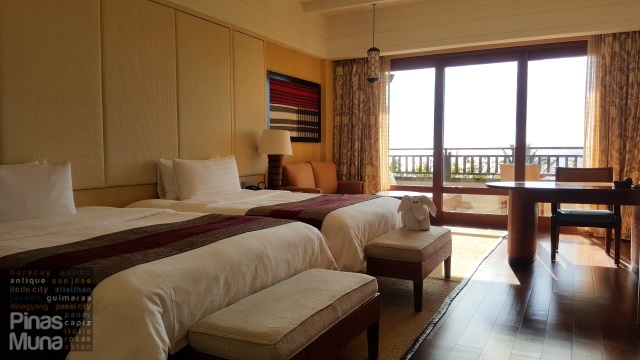 Our room has wooden floors accentuated by abaca weave rugs. Earth tones dominate the interior of the room with indigenous art pieces from Cordillera and Mindanao giving a strong Filipino character to the rather contemporary design of the room. 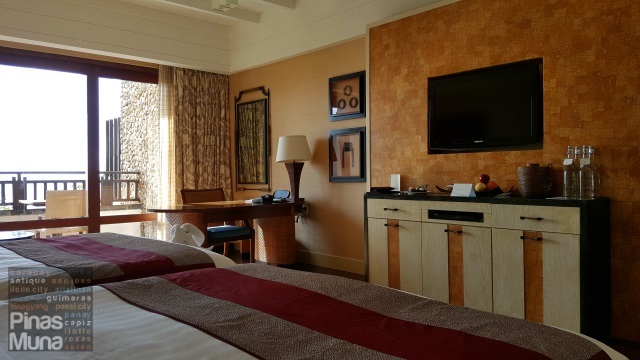 The Premier Seaview Room is luxuriously spacious at 63 sqm., and is furnished with twin beds, a writing desk, a sofa & coffee table. 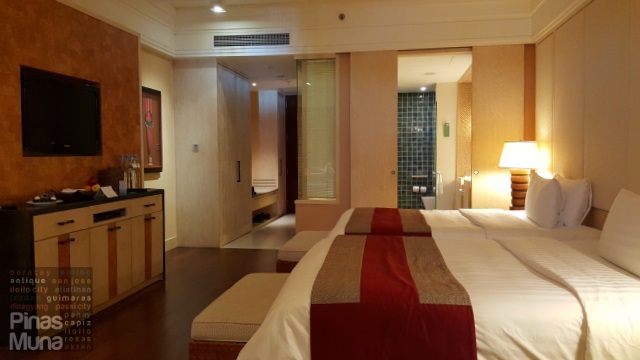 The room is equipped with an individually-controlled air-conditioning unit, a flat-screen television with cable channels, a minibar, a coffee/tea-making facility, and an in-room safe. 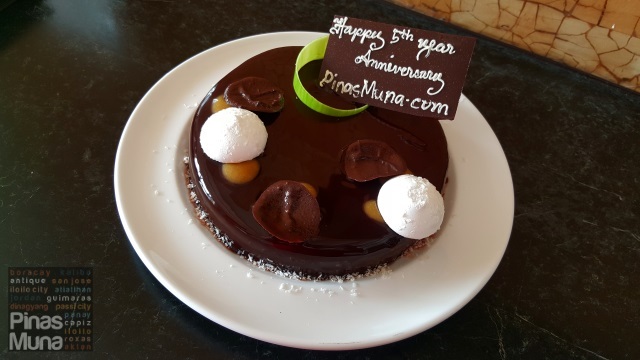 We visited Shangri-La Boracay last November 2015 in time for the 5th year blog anniversary of PinasMuna.com and the resort was very kind to prepare an anniversary cake to celebrate the special occasion. 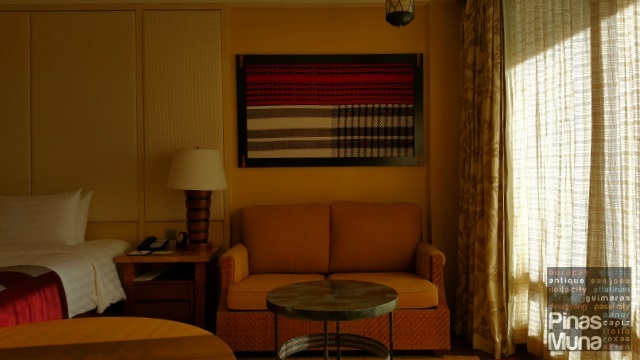 Our favorite amenities of the room has got to be the sofa and the writing table. The sofa is perfect for lounging where you can have a good view of the sea at the comfort of the air-conditioned room. The writing table was spacious enough for me to work with my laptop. Because of its orientation, I can place the chair either facing the room or facing the sea. Fast WiFi Internet connection is available inside the room which allowed us to stay connected. 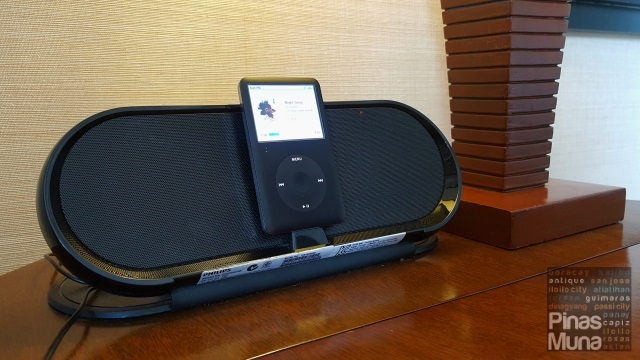 There's also an iPod dock with which we played music to set the mood inside the room. Our room also has it own veranda with a daybed and a table with chair. From here, one can have a panoramic view of the sea. The veranda is perfect in the morning when the sun is facing the other side of the building and cool breeze blows from the sea. Highlight of the premier rooms located at the Timog building cluster is their close proximity to Punta Bunga Beach. From the veranda, guests can enjoy a panoramic view of the sea. The powdery white sand and the crystal clear waters of the beach are just a few steps away. Our beds were so sublime. The mattress has the perfect firmness, neither too soft nor too firm. The bed is tightly tucked-in with a high thread-count cotton top sheet. Finally, the bed is covered with a fluffy duvet encased in a silky-smooth cotton cover. Each bed had two fluffy king size pillows enveloped in crisp, clean and fresh pillow cases. A sliding door separates the ensuite bathroom to the bedroom. The floor is lined with tiles while chiseled marbles adorn the walls. Filipino inspired lamps made of capiz shells add warmth to the space. 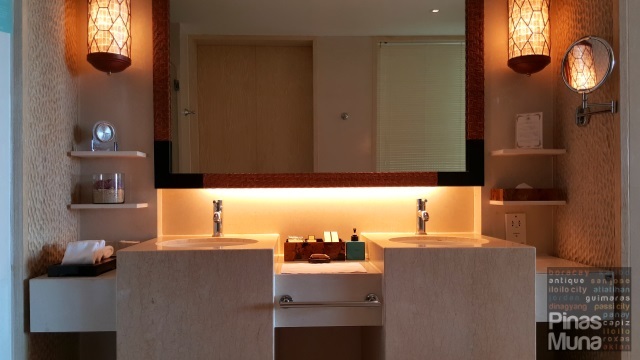 Our bathroom had double sinks with marble counter-tops. High pressure water flows out of the tap. In addition to the large mirror, there's also a magnifying mirror installed next to the sink. 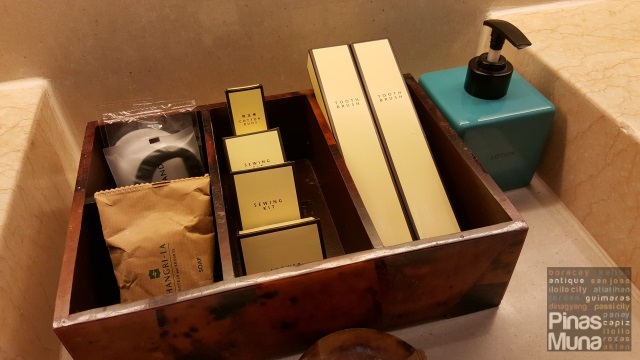 An extensive line of toiletries and bathroom amenities are provided including handsoap, two sets of dental kits, cotton buds, sewing kit and sanitary bags. Pañpuri-branded body and bath amenities are provided including shower gel, shampoo, conditioner and body lotion. 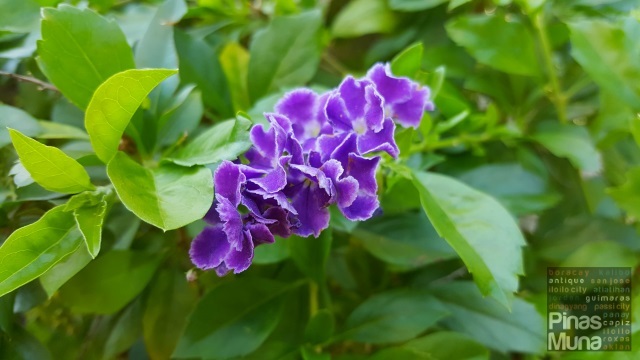 Pañpuri is a Thai luxury skincare, wellness and home ambiance brand that takes pride in the best Eastern botanical ingredients and utilizes a wide range of ancient and rich plants, roots and flowers. The spacious bathroom has a separate bathtub and walk-in shower. 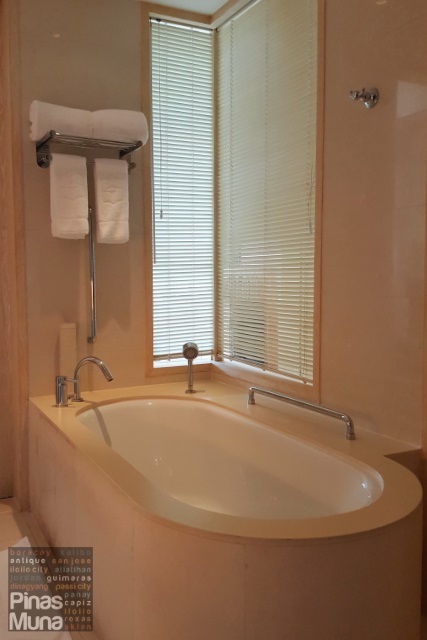 The bathtub is made of durable material and is maintained in excellent condition. 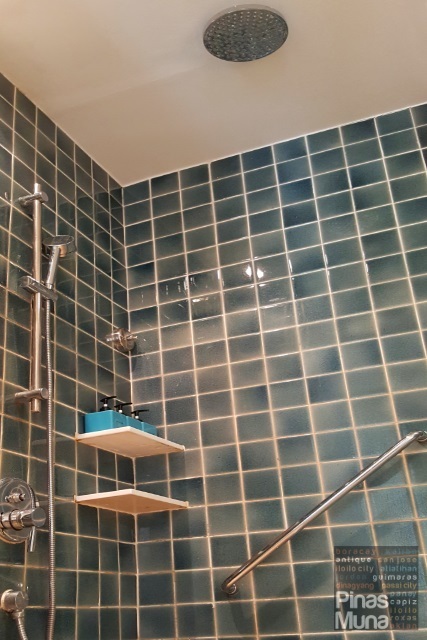 The walk-in shower is lined with blue tiles and is installed with a handheld shower-head and a rainshower-head mounted to the ceiling. Hot and cold water is available and temperature is easy to regulate. The toilet seat is also made with durable material and the flush works perfectly. It is however not installed with a bidet. Clean, thick and high quality cotton towels are also provided including bath towels, hand towels, face towels and foot towels. 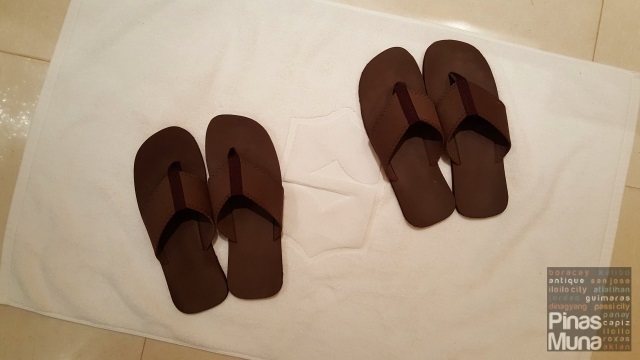 Each checked-in guest is also provided with beach slippers. After getting settled in our room, it was time to hit the beach. We first checked out Punta Bunga Beach which is right in front of our building cluster. From our room, we took the elevator to the lowermost floor and went to the stairs leading to the lawn. We just followed the footpath which led us to Punta Bunga Beach. It is the longer beach which features powdery white sand and clear blue waters. The sand here is not as fine as the sand at Boracay's White Beach, but still far better than many white sand beaches in the country. 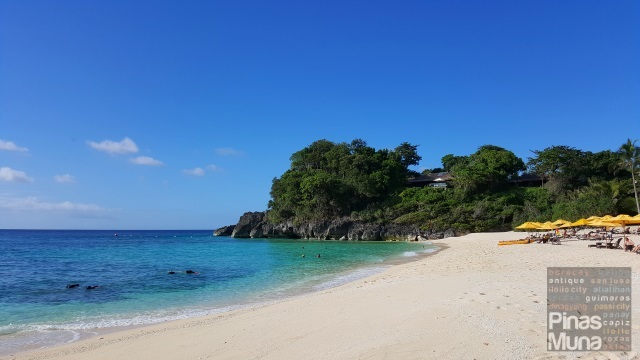 It's a luxury to find yourself in an uncrowded beach in Boracay and that is one of the premiums of staying at Shangri-La Boracay. We spent about an hour at Punta Bunga Beach, and we then decided to check out the swimming pools and the other exclusive beach of the resort. From the beach, we went back up to our building where we took the golf buggy to take us to the swimming pools. Shangri-La Boracay has a bigger free-form swimming pool and a smaller infinity pool. 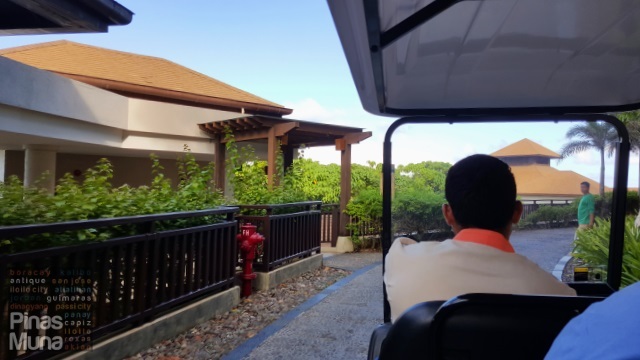 From the buggy station, we took a leisurely walk through the resort's plush gardens of tropical trees. Everywhere you go, you will always come across an interesting spot. All the staff were very hospitable and would always greet you with a warm smile. 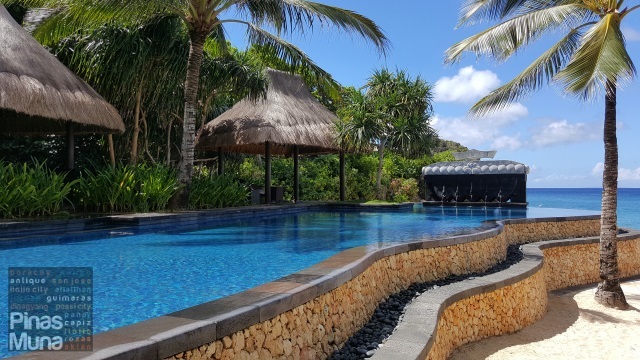 The pools are surrounded by coconut trees and there are cabanas scattered around so you can definitely find your very own private space. The best spot would have to the infinity pool which seemed to connect to the vast sea at the background. The infinity pool has a depth of 4ft to 6ft. We noticed that most guests stay at the bigger pool and very few knows that there is a separate infinity pool. We actually enjoyed the infinity pool to ourselves the whole time we were there. 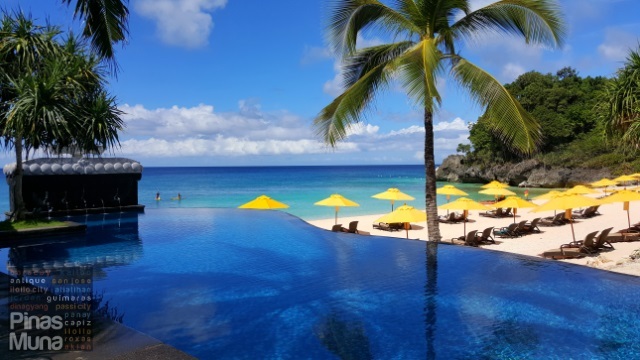 From the infinity pool, you can already have an unobstructed view of Banyugan Beach, the smaller of the two exclusive beaches of Shangri-La Boracay. This beach is more accessible if you are staying in one of the guestrooms located at the resort's main building. Banyugan Beach also features powdery white sand and clear blue waters. The sand quality here is just the same as in Punta Bunga Beach. The only advantage of Banyugan Beach is that it has an F&B outlet located next to it where guests can order drinks and snacks while enjoying the sun and the beach. Below are photos of Banyugan Beach and Punta Bunga Beach. As you can see, the sand is equally white, the waters are equally clear. Both are great for swimming. 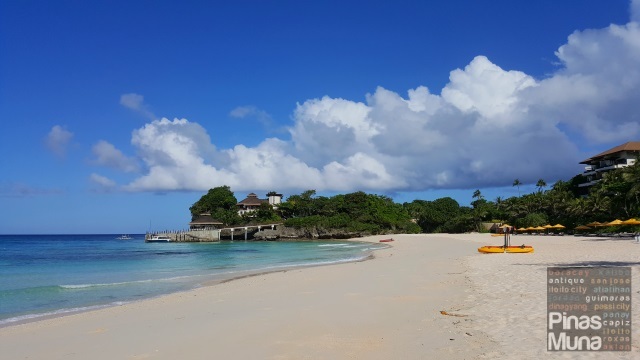 While Banyugan Beach offers the convenience of having a beachside bar, Punta Bunga Beach offers wider open spaces for outdoor activities such as beach volleyball or beach running. Shangri-La Boracay actually has a third swimming pool located at the Chi Spa complex. We weren't able to visit it during our stay but we were told that it is a lap pool that is seldom frequented by the resort's guests. 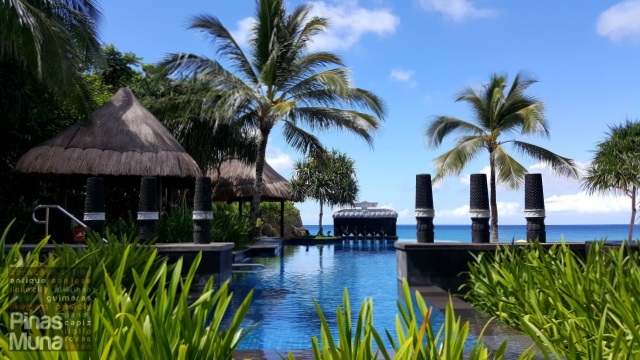 But if your idea of an ultimate luxurious vacation is having your own private pool, then one of the resort's villas is the perfect accommodation for you. Check-out the pools and villas in the video below. 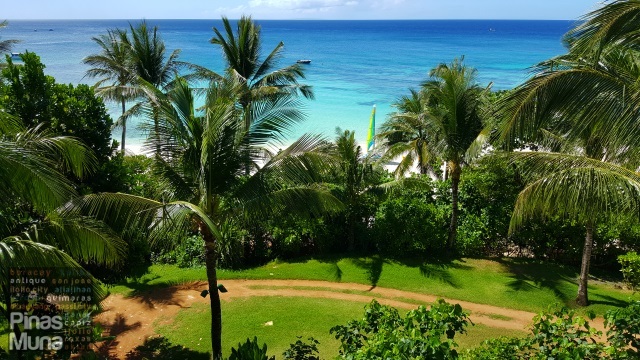 It was then time to go back to our room to prepare for the most anticipated part of the day, it is the time of the day when visitors of Boracay flock to the beachfront to watch the majestic Boracay Sunset. On our first day at Shangri-La Boracay, we decided to watch the sunset at the comfort of our own veranda. If you love sunsets and consider it as one of the highlights of your day, we highly recommend that you book a seaview room, it's totally worth it. If you are not staying in a seaview room, then the best spot for you to watch the sunset would be at one of the cabana lounges at Solana sunset bar. To get there, just take the buggy and tell the driver to bring you to Solana. Lounges at Solana are at high demand during the sunset hours and unfortunately, the resort does not accept reservations here. So to be guaranteed of having your own lounge, you must be there very early. 4:00pm would be a good time. We've visited Solana several times in the past, even before our recent stay at Shangri-La, and nothing really compares to the experience of watching the sunset from here. Yes, walk-in guests are also welcome to have a drink or two at Solana while enjoying the dramatic setting of the golden sun. Shangri-La Boracay has a total of seven restaurants, one of which is Sirena located right next to Solana sunset bar. Sirena is the resort's signature seafood restaurant which serves only the freshest and highest quality seafood. 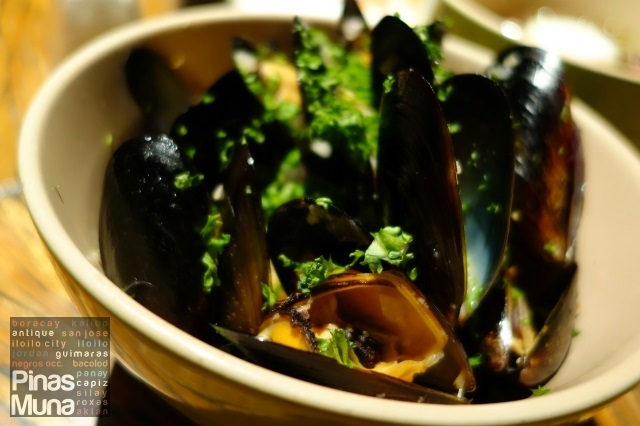 We highly recommend the Creamy Mussel Pot which is a dish of giant mussels steamed in Chardonnay and flavored with garlic and dill. 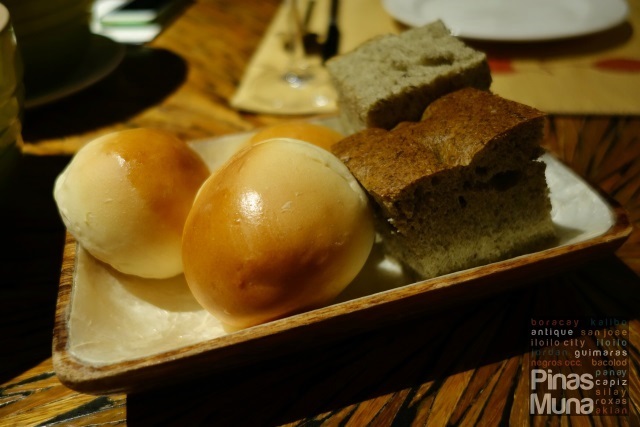 It goes perfectly well with the complimentary focaccia bread. 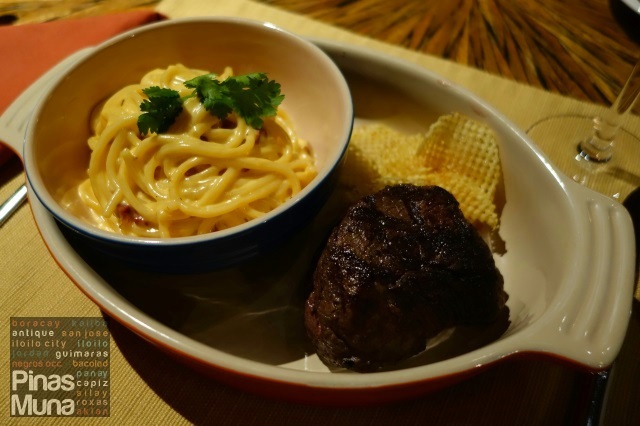 If you don't eat seafood, Sirena also serves meat dishes such as steaks and grilled pork and chicken. Don't forget to finish your meal with dessert. 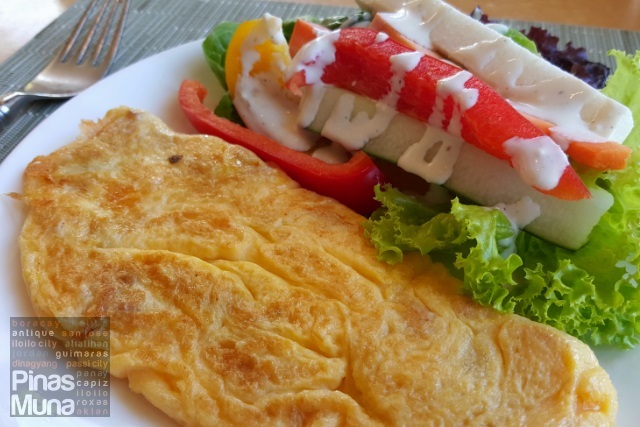 After a long night of uninterrupted sleep, waking up in the morning has never become difficult when you feel re-energized, and especially when you know that Boracay's best buffet breakfast is waiting for you. 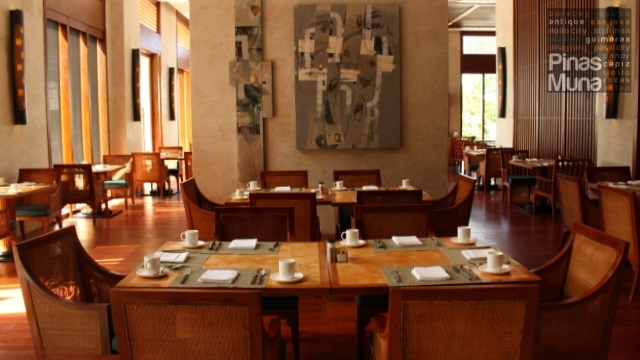 Vintana is the resort's all day dining restaurant located at the main building and accessible from the resort's lobby. 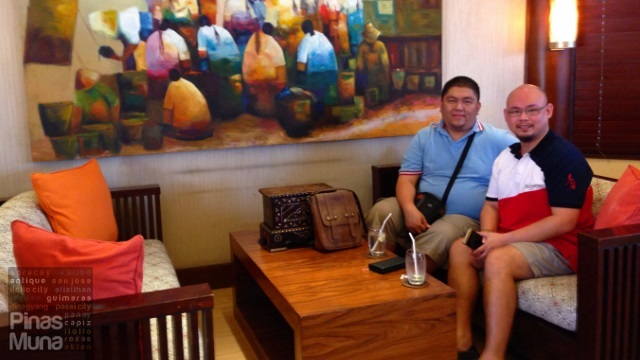 Our two nights stay at Shangri-La Boracay included daily buffet breakfast for two persons at Vinata. The buffet spread features a good mix of local and international dishes. There's an assortment of breads and pastries, fresh fruits and salads, Continental choices of cheeses, cold cuts, dried fruits and nuts. There's an Asian section featuring Chinese, Japanese and Korean breakfast dishes. There's also an egg station where you can have scrambled or sunny side eggs made or even have an omelet customized. 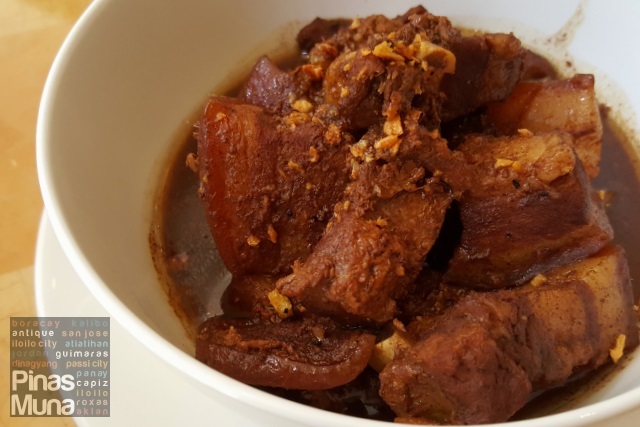 There is a wide selection of main dishes including Filipino favorites such as adobo, daing na bangus, beef tapa, salted eggs, garlic rice and pancit. Of course, breakfast won't be complete without bacon and sausages. Our favorite item on the buffet is the bibingka which are cooked right at the restaurant. They are moist and had a perfect creamy, buttery taste. There's also an ice cream station for the kids and parents alike. Vintana also serves a la carte dishes from its menu that features international and local cuisines. 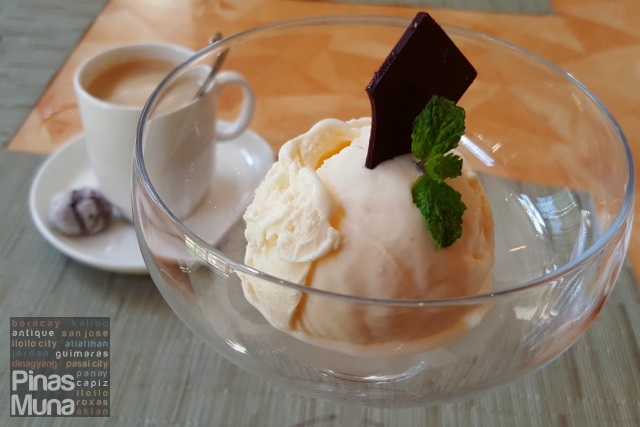 With so much options to choose from, with it high quality culinary standards and with its competitive pricing, there is virtually no reason to go searching for a memorable dining experience outside the resort. 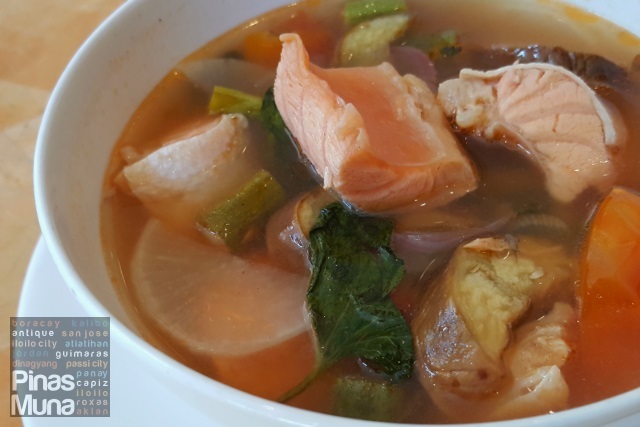 Here are some Filipino dishes we had for lunch at Vintana. 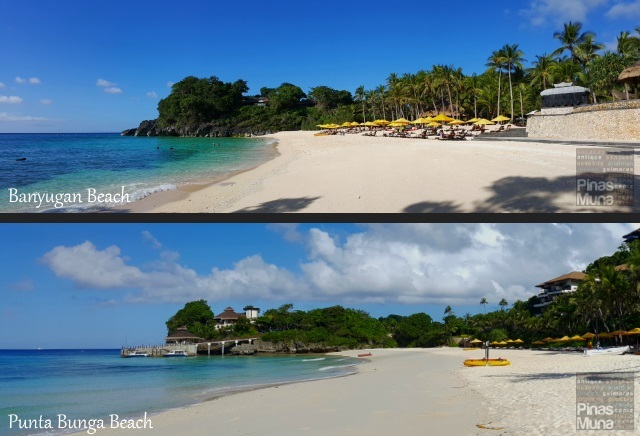 The three days we spent at Shangri-La's Boracay Resort & Spa has been the best three-day vacation we had in Boracay. 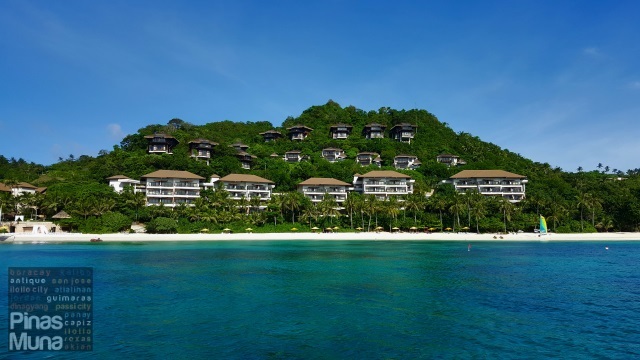 Shangri-La is indeed the best luxury resort in Boracay, Philippines. 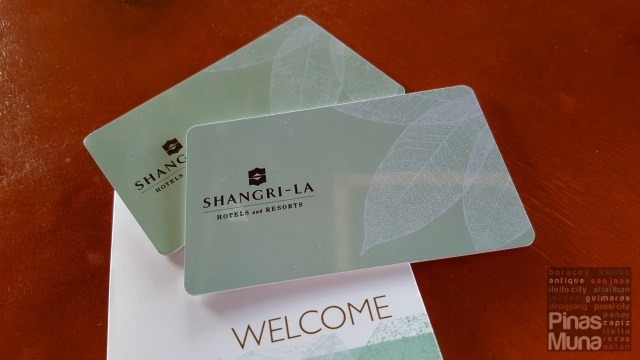 I don't think there can be any other resort that could match Shangri-La Boracay for its elegance, top of the line amenities and top notch customer service.